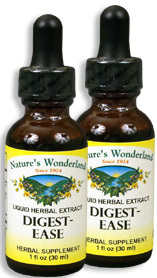 Digest Ease, 1 fl oz / 30 ml each (Nature's Wonderland) - Penn Herb Co. Ltd.
Digest-Ease is the fast-acting relief you reach for to help digest heavy protein and fatty meals. The bitter tonic is perfect before or after meals to help calm upset stomach, and to ease gas & bloating. Gentian Root, Blue Flag, Oregon Grape…bitter tonics encourage proper digestion of proteins & fats. Ginger, Fennel, Licorice…sweet, spicy, aromatic herbs balance bitter taste as well as relieve sour stomach and occasional acid indigestion. Before digestive discomforts spoil your next meal…get Digest-Ease! AMOUNT PER SERVING (350mg/ml or 30 drops): Proprietary Blend Certified Organic Gentian Root, Certified Organic Fennel Seed, Oregon Grape Root (ethically wild harvested), Certified Organic Licorice Root, Certified Organic Fresh Ginger Root, Prickly Ash Bark (ethically wild harvested), Blue Flag Root (ethically wild harvested), Peppermint Spirits, Potassium Carbonate. OTHER INGREDIENTS: Grain Alcohol (45-55% by volume), Deionized Water. Free of: milk, dairy, egg, fish, shellfish, tree nuts, peanuts, wheat, gluten or soy. Promotes healthy digestion; supports body's production of digestive enzymes such as hydrochloric acid (HCl), lipase, pancreatic enzymes, which support protein, fat and carbohydrate digestion. Relieves gas, bloating, sour, upset stomach; stomach ache; soothes gastrointestinal tract. Note: If irritated stomach and bowels, consult healthcare practitioner before use. 15-60 drops in water or juice, 2-3 times daily or as needed. For occasional use: 30-60 drops before or after heavy-to digest meals. DO NOT TAKE DURING PREGNANCY OR WHILE NURSING. Shake well before using.